Jayne is very excited to be back at Lovelane! She previously volunteered and taught here when this Lincoln facility was first built. She has a BA from Boston College, a Juris Doctorate from University of Bridgeport School of Law & an AS in Occupational Therapy from St. Philips College. Jayne holds her MA licenses as an Occupational Therapy Assistant and as a riding instructor. She is also a PATH Certified Therapeutic Horseback Riding Instructor. 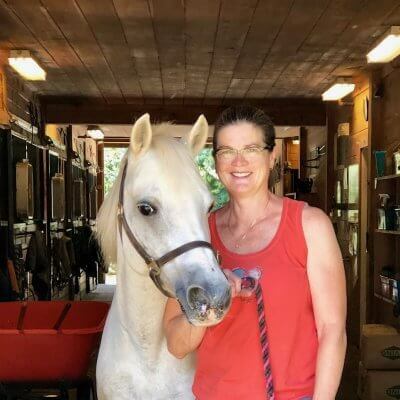 As the wife of an US Air Force officer, Jayne has lived many places and was able to meet and work with horse and pediatric professionals in many states. A lifelong equestrian, Jayne started her riding career as a 5-year-old, when her father brought two Shetland ponies home to her. Today she has a similar small farm at her home where she keeps her dressage horse. She has also been a professional groom/braider at top hunter jumper and dressage competitions across the country. After 14 years of working in Massachusetts Public schools as a COTA delivering Occupational Therapy services, Jayne has retired. She now only works part-time for the Barrett Family Wellness Center and has returned to Lovelane to combine her lifelong love of horses and children. At Lovelane, she finds life lessons through horsemanship for everyone involved. A place to not only cultivate the love of horses but also to help make a difference in the community. She is thrilled to be a team member at Lovelane again! Horses, children, and helping people take on challenges have always been a big part of her life and she hopes they always will be.